You are perfect as you are. However, over the course of a typical workday it is easy to forget this under the stress of meeting the needs of clients, colleagues and other stakeholders. Rather than attempting to fix you, How to deliver your potential successfully on the stage of work was written with the aim of sharing everyday coaching tips to help you as you go about giving your best, regardless of what the task involves or where it occurs. Divided into bite-sized chunks, How to deliver your potential successfully on the stage of work brings together ideas associated with the stage for the sake of ensuring your potential is the star of the show on a daily basis. As with any assignment, the delivery of your potential represents more than what is experienced by the audience or beneficiary of your work. What is visible once the proverbial curtain has been raised is the fruit of much effort, consisting of initial assessments, detailed preparation and precise practice, geared to offering your best possible performance. And then being able to repeat this as necessary. From the preparatory phase of any project, to the feedback and learning opportunities deriving from post-performance reflection, the giving of your best is achieved not by luck, but through a systematic use of tried, tested and learnable skills. Beginning with an exploration of the roles you are expected to undertake as part of your job description, to an examination of what is needed to ensure your presence ‘on stage’ represents the true you, these and other aspects of your daily performance are covered in the opening chapters. Input concerning preparation for the delivering of your potential is then dealt with, leading to the moment of execution. To complete How to deliver your potential successfully on the stage of work, key points regarding the learning available post-performance in the form of feedback – uplifting when full of praise and useful if critical – are set out in the concluding chapter. Throughout How to deliver your potential successfully on the stage of work questions are asked. Accordingly, it is advisable to read this self-help book with a notebook and pen or pencil to hand to capture reflections, thoughts and answers. Similar to any form of professional and personal development material, the value of How to deliver your potential successfully on the stage of work is found in its adaptation and application to your specific needs on your stage of work. 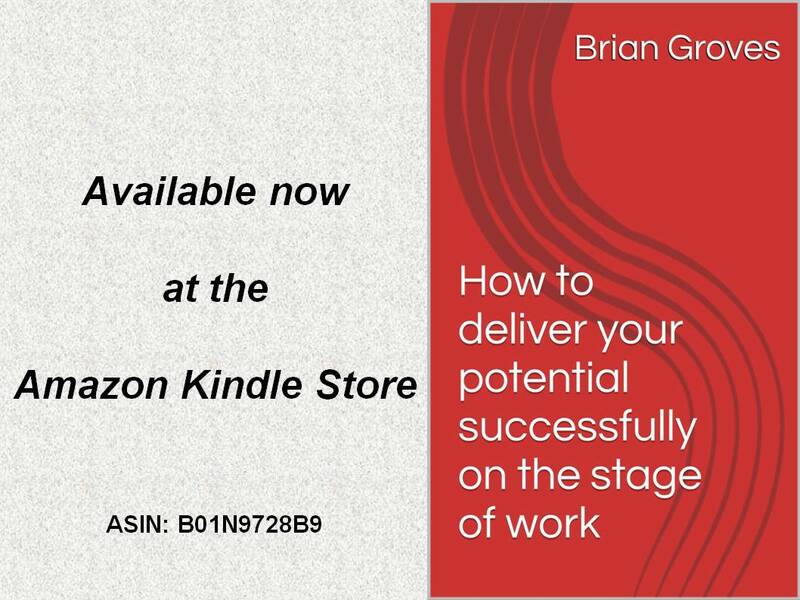 How to deliver your potential successfully on the stage of work is available now at the Amazon Kindle Store.